In a speculative development by insurance firm Aviva, a tower was required to be built in La Défense district in Paris. The competition carried out in 2008 saw Robert A.M. Stern Architects (RAMSA) winning with their design proposal of a pleated glass curtain wall tower that would sew the detached towers in that location into a connected neighbourhood. Robert A.M. Stern Architects, whose senior partner Robert A.M. Stern appeared in our list of 40 famous architects of the 21st century, is a firm that has always been known for Neo-Classicist and gracious architecture. 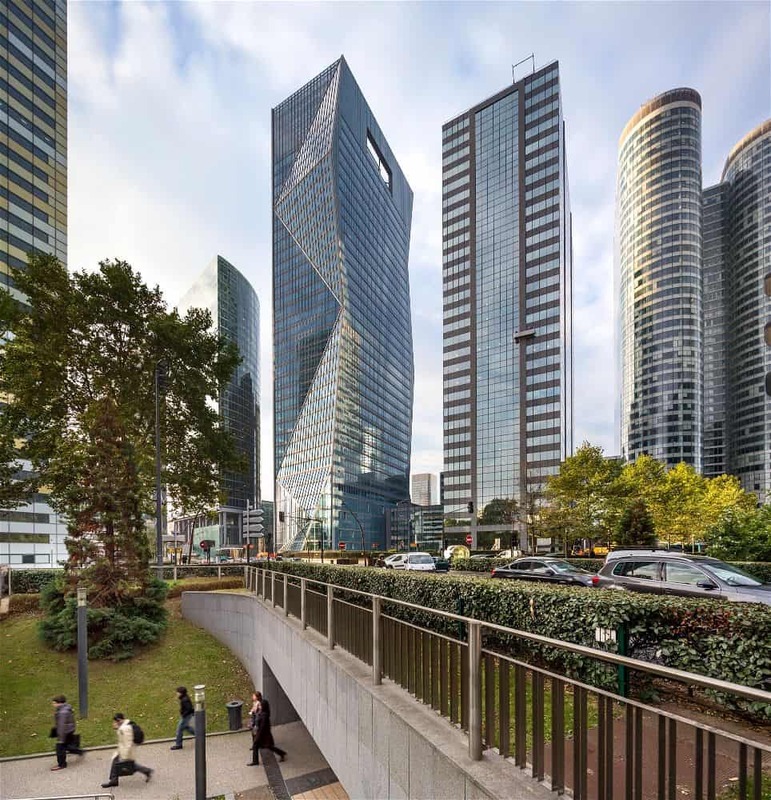 However, for the Tour Carpe Diem, the firm employs a totally different approach to light up this part of the La Défense district with outstanding modernism. The location of the building represents one of France’s largest complex; with more than a dozen towers neighbouring one another to bring 5.6 million square metres of office and commercial space together built over a period of half a century since the 1960s. The location is a large plinth that’s now known as “the Pear” because it sits at the end of the same axis as the Arc de Triomphe and the Louvre. The surrounding area is very high traffic containing road and train networks that bring people into and out of the district. The Tower which was completed in 2013 is a step forward in La Défense’s quest to add more pedestrian-friendly and environmentally responsible buildings into its pocket. Recently, the agency that runs the district has revamped their plans to turn this surrounding into a pedestrian-aware district by supporting street lunchtime eating venues and incorporating shopping areas. Despite these efforts, the area has largely remained a business powerhouse. A pedestrian street leads to the building’s lobby whose most outstanding feature is the magnificent stair that descends to a plaza on the Boulevard Circulaire. The plaza opens up into a second front which initially was just the “back of the site” but has now been transformed to a visitors welcome area with a boutique and a VIP entrance to another lobby above it. The Tower connects the raised esplanade and the urban fabric of the city of Courbevoie to the north. The building’s mezzanine floor houses an employee restaurant and a corporate cafeteria with impressive views of the descent and ascent of the Boulevard. On the raised esplanade a 17 metre high winter garden has been incorporated into the design to provide visitors with a place to meet. The sky-lit oasis provides users with a chance to have interactions next to an exotic garden. By adding a spa facility next to this garden, the architects wanted to increase chances that people might actually come to the garden when they are in a relaxation mood and require something in the sort of a relaxation theatre. In a building with many employees, it’s easy to get this place under use for several breaks during the day when they might want to break off from the web of staircases, walls and equipment into a place where they can get charged for another round of paperwork. The winter garden being a double volume space provides more lighting and views to another restaurant one level above it. Tour Carpe Diem has 30 office floors. The architects wanted to provide maximum lighting and impressions of the district and city which led them to design for a column-free space. At the rooftop is a clubhouse and a bigger garden made in the image of the garden at the base. 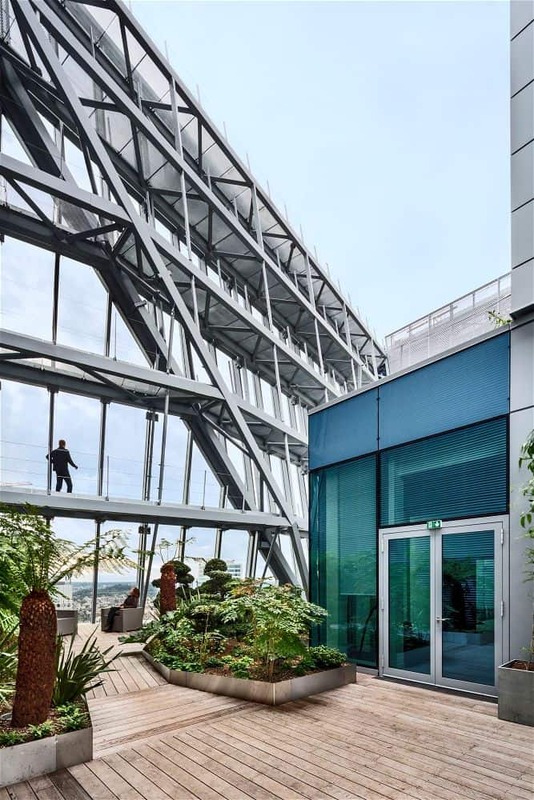 Users of the building can go up to the rooftop to experience the garden which also provides amazing views into Paris at a larger scale. On the periphery of the garden, meeting rooms and conference facilities coupled with an 80-seat dining room provides a state-of-the-art meeting space for booking or use by the building’s occupants. The architects believe were it not for a few complications in the building codes, the building would be a net zero energy building. The zigzag shape of the short façades is a strategic design decision. Due to the building’s orientation, the pleated glass façade shades itself at certain times of the day with the movement of the sun. Occupants don’t have to worry about glare or the afternoon sunlight that gets into the building at such heights in the afternoon. The building achieved LEED Platinum status and the French equivalents of building with low usage and very high energy performance thanks to its reliance on geothermal wells as its main energy source. Additional sustainability measures employed include solar water heating, a heat recovery system, high-performance lighting, controls for daylight dimming, occupancy sensors, computer-assisted shading and energy distribution, on-site ice storage, chilled beams in the office floors, recycling of rainwater collected from the roof garden, use of La Défense’s central steam heat for standard energy loads, low general lighting combined with high-performance task lights, and bicycle parking. For a modern office tower, Tour Carpe Diem plays and acts the part; and stands out with a strong identity among other towers in La Défense. It is a welcoming office space for several employees and customers, providing comfort in the office and further breathing space by the provision of relaxation and meditation gardens. Coupled with the building’s faceted glass façades and the architects great taste for wider staircases in two places that matter, (at the lobby; and the exterior connection between the raised and lower sections of the site by use of a monumental stair that landmarks that particular street) this building is nothing short of glorious.